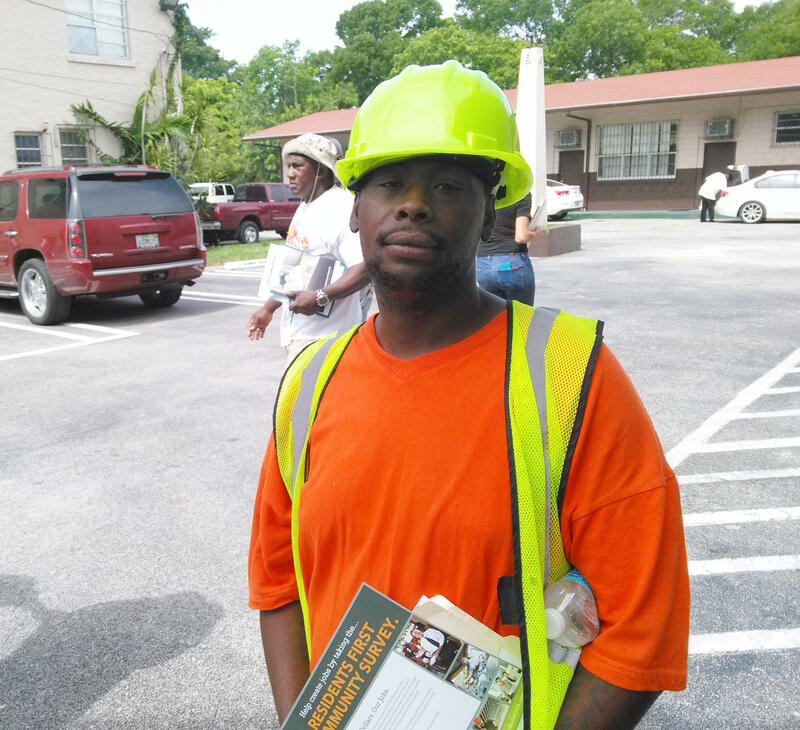 Frank Evans attended the Miami Worldcenter's job fair Tuesday. The Miami Worldcenter project hosted a job fair at the Historic St. Agnes Episcopal Church in Overtown that drew hundreds of people from across Miami-Dade Tuesday — including many Overtown residents. The project is expected to create 18,000 direct jobs. And while some have been critical about the Worldcenter’s impact in Overtown, Miami Commissioner Keon Hardemon said Tuesday’s turnout is evidence that people in the community see the project as something positive. "The people who are in the community, who many times are not available to be at public hearings, they’re happy with the type of pay they’re going to get with this project," he said. "They’re happy with the development that is coming to Overtown." Many who stood in line to fill out job applications said they were cautiously optimistic that Miami Worldcenter could be an economic engine for Overtown and its residents. Charles Evans lost his job at McDonald's four months ago. Since then, he said he's been looking for a job with no success. "I need some work. I've been going all over the world and I need work," he said. "That's why I came down here." He said he didn't have much experience working on construction sites, but if Miami Worldcenter is willing to train him, he'll take any entry-level job being offered, he said. "I ain't picky," he said. "Anything they got, I'll take it." Aesha Lewis said a few years ago she was working as an adult entertainer. She said she wanted a career her kids would be proud of so she enrolled in Miami Dade College's Hospitality Institute at the Greater Bethel AME Church in Overtown. She's currently working as a cook at the one of the college's cafes, but she's hoping she can land a higher-paying position at the Worldcenter. "I know with better jobs, better opportunities," she said. "Better things. Better stability." With more money, she said, she'll be able to move out of the rooming house she lives in and into a decent apartment in Overtown with her four kids. Frank Evans hasn't worked in two months. He said in that time, he's gone to at least four job fairs similar to the one Miami Worldcenter hosted Tuesday. The fairs, he said, were a waste of time. "I’m looking for a job as a heavy equipment operator," he said. "I have been unemployed since May and it’s particularly frustrating when I come to these job fairs and I never hear back from the people I’m filling out the applications for." In his hand, he held copies of his resume. This time, he said the city says it's holding Miami Worldcenter accountable for hiring Overtown residents. He said he's not sure if this fair will be different from the others. A new program at Broward College has just eight students and seeks to train the next generation of South Florida artists and designers. The school hopes to earn a national certification for the Visual Arts and Design Academy this spring – becoming the first community college in the South to have that. The land along Key West's western shore was one of the first areas of the island to be developed, when the U.S. Navy established a base there in the 1820s. It eventually became known as Truman Annex, after the president who liked to vacation in Key West. Now it's called the Truman Waterfront, and it's set to become a new park for the city. Key West Mayor Craig Cates says it's always been an important part of the city. The City of Fort Lauderdale may get a new outdoor concert venue along its riverfront. Levitt Pavilions, a national nonprofit organization, recently selected the city to receive seed funding and technical support to develop a public performing arts space in Esplanade Park.